Hey guys! 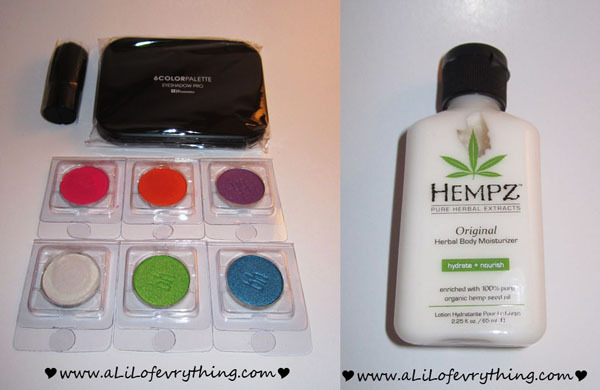 I'm doing a Facebook GIVEAWAY!!! It's to thank you guys for "liking" and following my page. 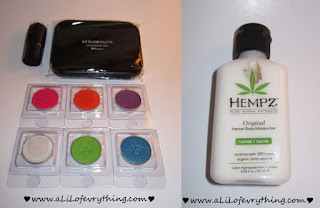 I'm giving away BH Cosmetics 6 eyeshadow palette, my favorite lotion Hempz Original travel size Moisturizer and a mini kabuki brush. I picked out the 6 colors and they are BHCS06, BHWS09, BHCS14, BHWS20, BHCS13, BHMS13. The rules are simple: You MUST "like" my Facebook page and leave a comment with your e-mail address and what color shadows you like to wear during the fall/winter season. That's it! I think this fall/winter season I would mostly wear neutral colors, because I'm comfortable using them and I like the impression of not having eyeshadow on my eyes. A good neutral eye color for me is beige-rose or beige-peach shaded with brown. Hi there! ^^ I liked you on FB - my name is Alicia Tonello. My e-mail is ragintuna at gmail dot com. I like the neutral colors!